What a fun team to watch! This championship match looked like the most fun, full of laughter, crazy plays, and friendly banter. We saw both teams leave their all on the court, but YOURS?! has proven to be a force this season and finished the game in two. I was most impressed by the team dynamic, which was clear to be a huge facotr pushing them into the finals. These ballers work together beautifully and communicate like they have been a squad for years. Jocelyn & Friends put up a nice fight, also functioning as an impressive unit, but YOURS?! executed killer serves and sweet digs that were hard to compete against. SPICE has proven to be a real force this season, dominating on the court with their deadly serves, wild digs, and all-around sheer athleticism. With a full team tonight, SPICE was ready to give it their all and win another Midcore champ. 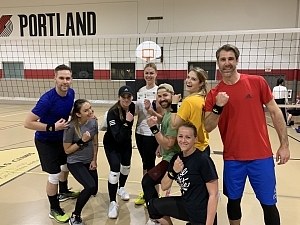 While they were able to win their match in two sets, Bump Up the Jam left their all on the court and gave an impressive fight, not quitting until the final match point was decided. Most impressive was SPICE's ability to execute 'bump, set, spikes' seamlessly and consistently. This only added to their strength, allowing them to function as a team that was hard to match this season. 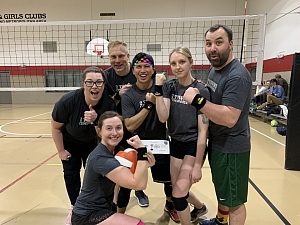 Notorious DIG swept the championship! With their trademark 'Two Towns' shirts, this group always showed up with a fire in their bellies, ready to battle until they leave their blood, sweat, and tears on the floor. It was clear that tonight was no exception, as the group showed up early and with their heads in the game. 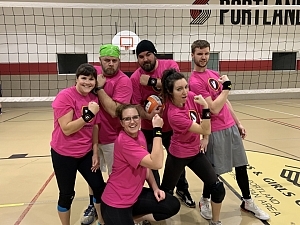 Thanks to their team communication, athleticism, and overall volleyball smarts, Notorious DIG was able to win their Underdog wristbands in two sets. This team consistently KILLS the ball with their spikes and serves, but maybe most impressive is their ability to operate as a single unit, never stopping the communication and highlighting each others strengths effectively. Inappropriate Touches gave an impressive fight, matching DIG's skill and allowing for a great final game.